Thanksgiving is one of those holidays we all love: it’s all about sharing with one another and remembering all that we are thankful for. And food. If you’re unsure what to make for your vegetarian guests this Thanksgiving or you’re interested in trying something unconventional this year, I have the recipe for you! 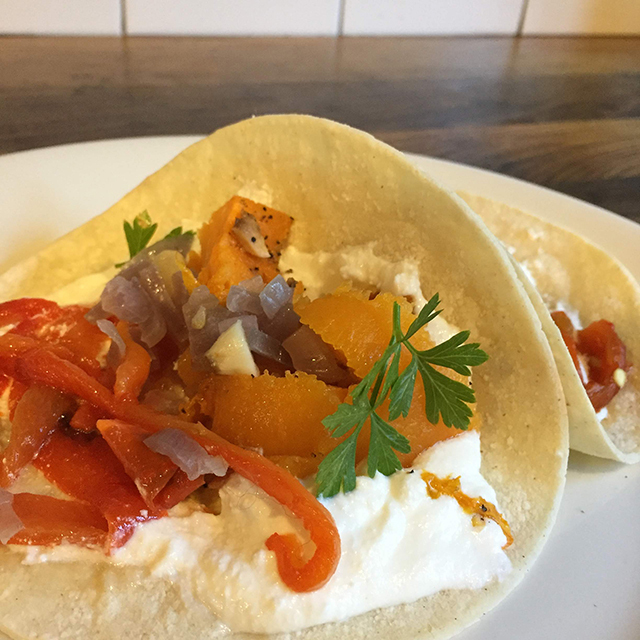 This autumn-inspired taco is delicious, beautiful in color and you can prepare it in advance. And who doesn’t love a taco station! There are several steps for each component which I will outline for you. It seems like a lot but it’s actually pretty simple. Prep time is about an hour and half. For the squash: Preheat the oven to 400 degrees. Cut the butternut squash in half, long ways. Use a sharp knife. Coat all sides of the squash with olive oil. Place the open side up on the baking sheet. Chop the garlic and place it on top – use a lot! Add salt and pepper. Roast for 25 minutes or until soft. Scoop out once it has cooled. 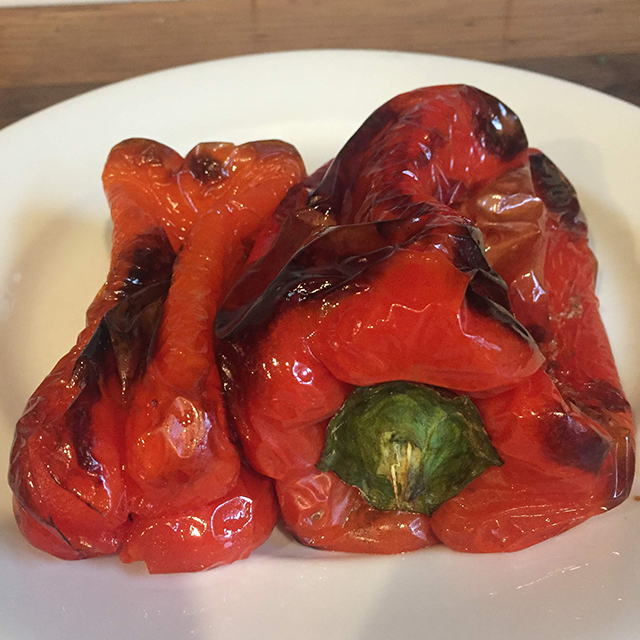 For the peppers: Preheat the oven to 400 degrees, you can roast the peppers at the same time as the squash if you have room. Poke a hole in each pepper, coat the peppers with olive oil. Roast in the oven, periodically turning them for about 30 min. until soft and the skin gets slightly blackened. Let them cool for 10 min. Peel the skin off and cut the pepper into thin strips. Save the juice for marinating. For the onions: Chop the onions, chop the garlic, about 4 cloves. On the stove top sauteed both ingredients in 2 tablespoons of butter on low. Once caramelized, add salt, pepper and two tablespoons of cumin. When you’re ready to serve, place all ingredients in a lazy susan or individuals bowls, don’t forget the ricotta and the parsley for garnish! Warm the corn tortillas in the oven. If you’re making this in advance, warm each ingredient in the microwave prior to serving. Enjoy!